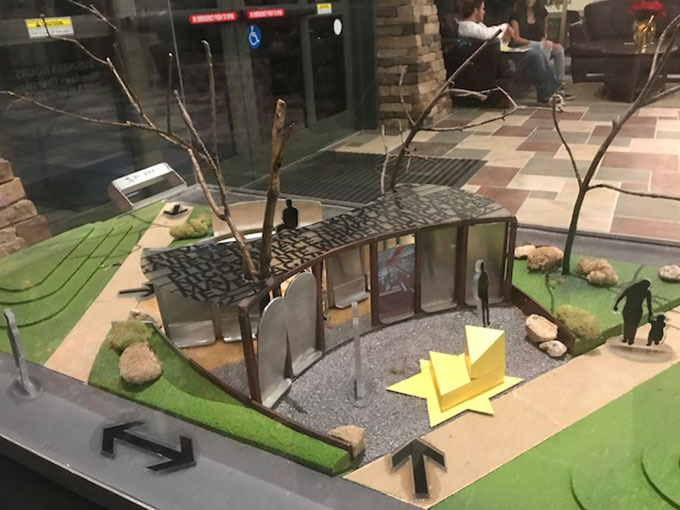 This model of the proposed Holocaust Memorial in Town Square Park was displayed at Tuesday's City Council meeting. The Murrieta City Council has approved a donation agreement for the creation of a Holocaust Memorial in the city's Town Square Park. By unanimous vote at its meeting on Tuesday, the council approved the agreement, in which the Holocaust Remembrance Foundation will pay for the memorial through fundraising. Cost of the memorial is expected to be in excess of $400,000. The memorial will be designed to be educational, with panels telling the story of the Holocaust, in which more than 6 million Jews were killed during World War II. The memorial will be a permanent fixture in Town Square Park, which already has a Fallen Warriors Memorial, dedicated on Veterans Day 2015; an Honor Garden with commemorative bricks; a Veterans Memorial, which will be expanded to include a POW-MIA Memorial next year; and a 9/11 Memorial, which will be expanded next year as well. According to Lea Kolek, park and recreation manager, the idea grew out of the annual March of Remembrance in April to pay tribute to Holocaust victims. "The memorial is designed to inspire the community to face hatred and genocide and to foster human dignity," she said.